Unique Hen & Bridal Parties! 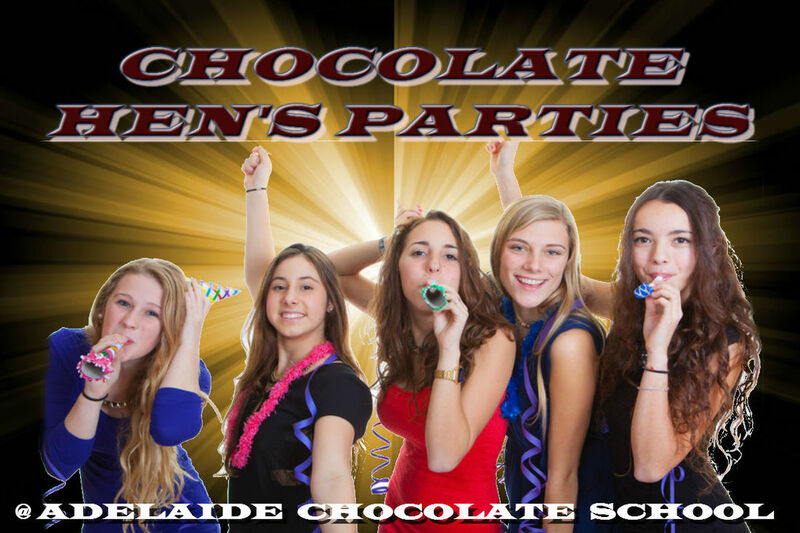 Tailor make a session for your group by creating a variety of themed chocolates to celebrate your hens night. Great for a one of a kind Hen's Night! If participants are over the age of 18 and with group consent, we can even make adult only chocolates with the use of our adult only moulds. The chocolate is unlimited - including milk, white, dark and coloured chocolate - plus we provide you with cellophane bags and ribbon to package up your chocolates to take home and show off! We even supply aprons so you can keep yourself clean if you are going out for lunch or dinner after the chocolate making fun! CURRENT BOOKING BONUS - currently all hens group bookings made will also receive the use of a complementary chocolate fountain with fresh strawberries and marshmallows for your group to use during the session as a gift from us! Friday Night - 6pm to 7.30pm and 8.30pm to 10pm. Saturday and Sunday - 10am to 11.30am, 12.30pm to 2pm, 3pm to 4.30pm, 5.30pm to 7pm and 8pm to 9.30pm. Click here to see available dates! Click here to send us an enquiry! Don't forget there are many fantastic restaurants along Melbourne Street that can be your next location for a fantastic day or night out with the ladies, and all in the one location! Yes you can book a party during the week subject to trainer availability. Weeknights are popular and you can have flexibility of times for Monday to Friday bookings. What do we do in 90 minutes? We do ask that groups depart on time at the end of a session as we have many sessions on one day and the trainer needs time between the sessions to clean up after each group and get ready for the next one. Therefore any party food, drinks and games need to be within the 90 minute session you have allocated and booked for. When it comes to themes we try and include the interests/hobbies of participants where we can. For example if someone loves music we have a range of music moulds or they may like sport, a particular animal or a character of some sort. Many hens groups request our adult only range of novelty moulds when the group is over 18yr’s of age. These moulds are set up at one end of the training space when requested and we also set up more family friendly moulds at the other end to ensure there is a variety for everyone. We have many, many, many different moulds that we can use to make each party slightly different from another if requested. We include any requested moulds as extras to our standard moulds that we place out for all groups. If you are unsure of the types of moulds the trainers will place out a selection they think is age appropriate and see what is popular and then build the range around this. If you have a theme you would like to include you will need to let us know with as much time as possible if we need to order in moulds as this can take weeks. Themes are no extra cost for a booking. Please note that we can’t guarantee all theme ideas. Can we bring extra drinks and food to parties? We do provide filtered water for all participants during the sessions. We currently have a promotion at the moment for all new hen’s night bookings – We provide a complementary chocolate fondue with fresh strawberries and marshmallows for your group to use during the session as a gift from us! You are also more than welcome to bring along additional food and drinks (plus plastic glasses) for your guests to enjoy if you wish to do so. Yes you can have party games included in your booking but please note that any games will use up time within the 90 minute session time. If games are requested we try and run them during the last 20 minutes while the last of the chocolates are setting. You can make a choice on the day of the event to include a game or not. Just chat to the trainer on the day so they can work with the times to include them if wanted.